Local Trust - Why measure impact? And how? Local Trust commissioned Resources for Change to find out the early impact of Big Local partnerships during their first years of delivering the programme, and also to find out what they are doing to measure the impact of their work. 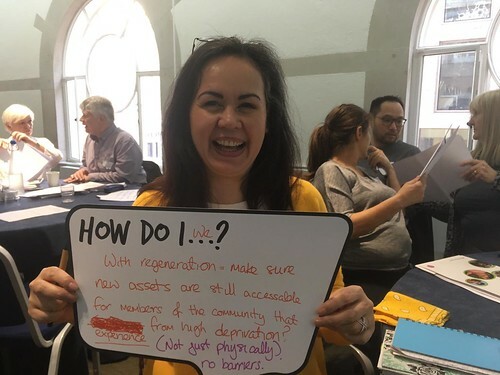 When our researchers visited 20 Big Local areas we met people who told us fantastic stories about the impact that Big Local activities are having on them as individuals and in the wider community. But what happens if you are not in the room with someone who has experienced these changes? The risk is that great stories are not captured by Big Local partnerships as evidence of what is changing in these communities. Why is it so important to measure impact? Big Local partnerships are accountable to the people who live in the area and it is important to be able to tell the story of what is happening. Big Local partnerships have created a vision for what the area will look like in 10 years’ time – they need to know if they are achieving that vision. Measuring impact helps improve what partnerships do and how they plan. Measuring impact helps other Big Local areas learn about what works. Having evidence of what impacts they are creating helps make the case that local people can plan and manage programmes that change their areas – there are still sceptics who are not convinced by this approach. People will have increased skills and confidence so that they can continue to identify and respond to local needs in the future. Each Big Local area has created its own vision for the local area and has set some objectives or themes. The way that impact is measured and reported should help to demonstrate how all this is being achieved. But tying it all together can seem complicated. Partnerships need to do this in a way that will make sense to themselves, their other partners and the people running activities on their behalf. There are many different types of information that can be collected, all of which are valuable to know about. Some of the Big Local areas we visited told us about some of the things they are doing to measure impact. Not relying heavily on written methods of assessment, which might exclude people. Not being too intrusive in how they asked questions because they didn’t want to put people off. How they need to follow up after the project has finished to find out about lasting changes. How they are trying to link together all the changes that different projects are creating. Some partnerships don’t have skills and resources to develop their impact measurement systems. Connecting up all the different layers of achievement and all the various activities. Being clear about what is impact measurement and what is not. What can we learn from these areas? It is important to have a ’light touch’ approach to measuring activities that have a social aspect to them – people don’t want to be filling out forms if they are having a night out. If a small community group is running the activity and they are only receiving a small grant, it would be inappropriate to give them lengthy forms to fill in. To identify long term changes, it is necessary to follow up and find out what happened to participants next – did the changes last? What did they do next? It can be useful to have stories to tell about what happened to individual people – and to have their permission to tell the stories to others. It can be helpful to gather information from others who might have noticed changes. Be clear about what is needed and include these requirements in funding agreements and in any forms given to to delivery organisations. Think about how the individual projects contribute to the overall goals of the area’s Big Local plan.